So when evening rolled around, Search and Destroy were eager to take over the world’s candy supply as the costumed duo, Prince Charming and Darth Vader. This was the year they really “got it.” They even picked out their own costumes (so much for my adorable twin themes). Capes and commendations attached and the two leading men of the evening were frothing at the mouth in anticipation. They hovered by the door waiting for a break in the rain – the biggest deluge in California in the past year. Side note: Someone clearly gave Mother Nature raisins in her plastic pumpkin basket. We all know how much California needs the water during this most recent historic drought, but dumping the skies the one night all the people will actually emerge from their technological hazes to walk the streets? Figures. The force was with both Search and Destroy as they raced down block after block in search of the alluring glow from a candlelit pumpkin and brightly shining porch light. “LET’S GO TO ANOTHER HOUSE NOW!” they shouted after each successful sugary procurement. You actually have to approach the door, not just stare back and forth between mom and the door from the sidewalk. Ring the doorbell once. Only once. Once total, not each. If you knock, do so firmly enough for a fellow human to hear you. If you knock, do not try to kick down the door (via the dark side or any other physical feats of strength). Say “trick-or-treat” when someone opens the door, not at the door. Even if you are dressed as Darth Vader, do not attempt to cut anyone’s hand off with your light saber. Actually, don’t poke anything in anyone’s house with your light saber or sword. Do not attempt to educate the neighborhood on the origins of your nickname by taking out holiday décor or accidentally beheading a scarecrow. Say thank you when you receive candy. It’s just good manners. We completed our circle of suburban delight. It turns out, the boys enjoyed handing out candy just as much as they fancied collecting it. But after a few handouts, they took seat in our living room to dump out and sort their loot. The doorbell rang. I answered it. A two-year-old walked right on in like he owned the place. Without hesitation, Search and Destroy scooted over to make room in what had just become a very powerful sugar-laden triumvirate. Maybe we’re the one’s who have something to learn about the basics of Halloween. And then he puked on me. “I threw up a little bit,” he continued matter-of-factly. 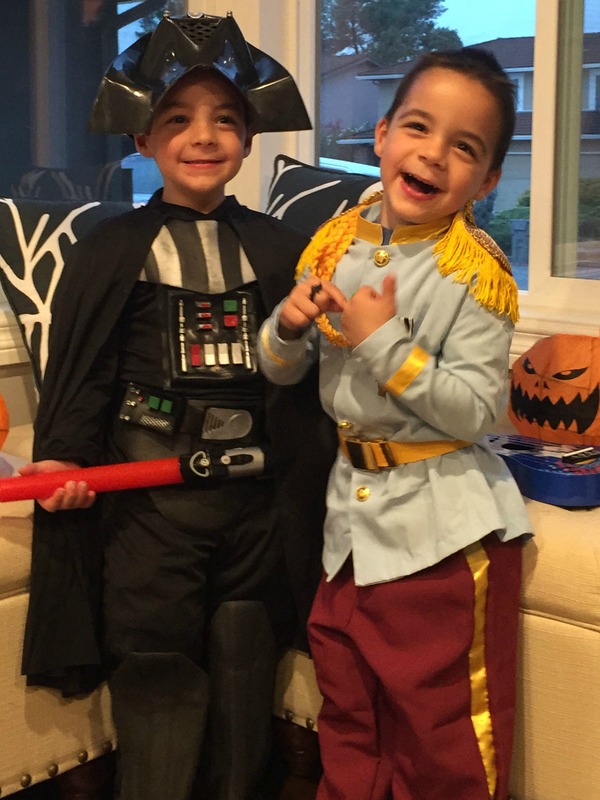 Yet, as I collapsed into bed after the long week and still longer evening, Search and Destroy (aka Prince Charming and Darth Vader) were still awake in bed – screaming, “trick-or-treat” back and forth as loudly as their little lungs would allow. I think we can all agree it’s not truly a successful Halloween trick-or-treating excursion until somebody pukes candy.